The ZoneFlex 7982 delivers consistent performance and maintains stable connections within high-capacity environments and to smart mobile devices that constantly change their location and orientation. The simple variation of a device's orientation can account for up to a 5x performance degradation among Wi-Fi products unable to adapt to such changes. To address these challenges, the ZoneFlex 7982 is the only three-stream 802.11n access point to combine dynamic polarization diversity with adaptive antenna arrays and transmit beamforming to give customers up to a 4x improvement in Wi-Fi performance, signal gain and reception. Power consumption: 5W minimum, 7W typical. Powered over Ethernet 802.3af/at PoE. POE Injector and Power Supply are sold separately. For deployment of multiple access points, a controller (sold separately) is highly recommended. Controller-specific features (such as Smart Mesh networking) are unavailable when the AP is running a standalone AP base image. This Unit is Powered over Ethernet (PoE) 802.3af/at ; PoE Injector and Power Supply are sold separately. For deployment of multiple access points, a controller (sold separately) is highly recommended. 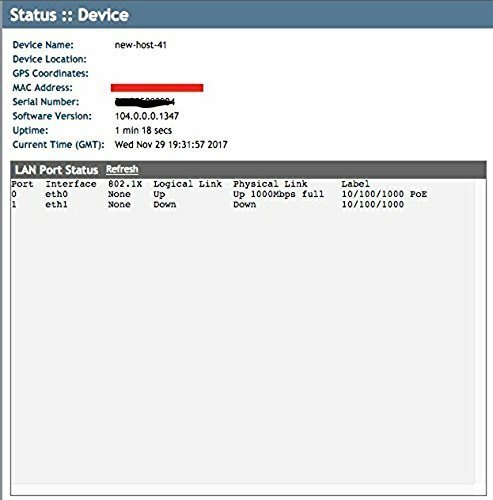 Controller-specific features (such as Smart Mesh networking) are unavailable when the AP is running a standalone AP base image.